No Man is an Island, Tropical or Otherwise. Historians of Medicine frequently tell the story of the nineteenth century as one of scientific and medical revolution. The century in which modern medicine was born – or perhaps it’s more appropriate to say: in which it matured from gangly adolescence into a socially promising young adult. Although it is just as true to call it a century of continuity as it is to call it one of change, the rise of science and its application in unprecedented intensity certainly had an impact on the elucidation and treatment of disease. The birth of hospital medicine, the standardisation of medical training and the increasing authority given to medical science shifted sites of ill-health, of diagnosis and of treatment, away from the home and into the new sphere of the institution. In tandem an often under-played rise occurred, the rise of laboratory science. Laboratory science manifested and still manifests in varying ways: from diagnostic tests to prescription drug manufacture; from biomedical research to medical training and demonstration. The laboratory is an important space for experimentation, empiricism, and ultimately progression. I won’t attempt to negotiate the pitfalls of the search for ‘objective truth’ or even try to analyse the relative merits (or otherwise) of scientific approaches to medicine; what I would like to look at is the collaborative opportunities of the laboratory. When the Liverpool School of Tropical Medicine was set up in 1898 it was a coordinated response to the increasingly pressing problem of tropical disease. These diseases (claiming the lives of colonisers and colonised alike) were no longer diseases of the ‘tropics’ that could be ignored by Westerners, but were increasingly being registered in the bodies of military officers (undermining notions of national security and colonial identity) of workers in the colonies (affecting British imports) and of sailors returning from Africa (jeopardising trade and economic prowess). These factors prompted Joseph Chamberlain – then Secretary of the State for the Colonies – to appeal to the newly formed university college in Liverpool (a thriving trade port) to set up a school dedicated to the study of tropical diseases. This school would use experimental methods to help understand and treat such diseases, complete with the first laboratory to hold live specimens of human and animal parasites! A group of ship-owners led by Alfred Lewis Jones (of Elder Dempster & co.) and John Holt (of John Holt plc.) pledged £350 per annum for 3 years to support the school, recognising mutual benefit in ensuring the health of their sailors and of their profits. The school’s first lectureship was given to Ronald Ross, soon to be the first British person to win the Nobel Prize for medicine, and the position of demonstrator to H.E. Annett. Other members of the school included physicians Joseph Dutton and John Todd, city bacteriologist Rubert Boyce and museum curator and farmer Robert Newstead. These men, hailing from very different backgrounds, all worked individually and collectively to help elucidate the burdens of parasitic disease, participating in practical expeditions and laboratory research. 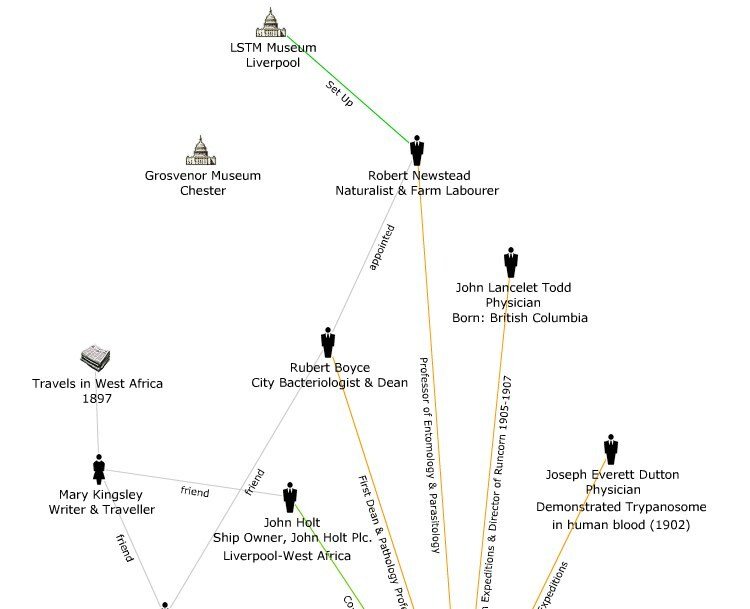 They belonged to an emerging discipline with a new public and professional face; the Liverpool and soon after London School(s) of tropical medicine were just two of the many institutions popping up across the colonial globe in response to the increased need for specialised disease knowledge. Much of the key work has been done by individuals in laboratories – toiling away with microscopes, slides, participants, patients and infectious agents as their tools of discovery. Their experiments were repeated and corroborated (or not) by others, theories proposed and disseminated, contested and confirmed; and although not always in direct contact with others in the field, they maintained a strong network of correspondence. Ross and Manson represent a famous example of this collaboration – exchanging over two hundred letters between May 1895 and Manson’s death in 1922. These two men forged a complicated relationship as colleagues, friends, advisors and rivals, but ultimately the support Ross gained from Manson’s tutoring and encouragement led to his discovery that the anopheles mosquito acts as a vector for the human Malaria parasite. Joseph Everett Dutton and John Lancelot Todd also collaborated in the endeavours to elucidate parasitic disease via experimentation, accompanying each other on dangerous expeditions. Both men would contract Trypanosomiasis – the very disease they had helped to investigate – and Dutton would die from it, at just 29 years of age. Parasitologists employed laboratory and experimental science in their attempts to contribute to understandings of, and solutions to, the problem of tropical diseases. The practical, theoretical and philosophical approaches required of them often placed them in isolation, either physically or professionally; however a strong connection to an emerging research community pushed them to persevere. This conceptual network of parasitologists reminds me of the PhD student – often lone researcher powered by sheer enthusiasm, a sense of duty – and usually a disproportionate amount of caffeine! – who belongs to a wider research institute and, if switched on, collaborates with other researchers, helping to realise the full potential of their own discoveries and with any luck providing the intellectual foundation for future ones.